When the buzz from a new text hit my pocket near the NBA Trade Deadline, I knew GM John Paxson had found somebody to take Big Ben Wallace. What I never expected was to read the name Larry Hughes as the main chip in return. In an era when salaries rule the NBA landscape, the Bulls traded their overpriced fan-hated center for the Cavs overpriced fan-hated guard with virtually identical expensive and long-term contracts. As for the rest of the pieces, while veteran Joe Smith was one of the lone bright-spots in a horrendous season, most would admit PF Drew Gooden is an up-grade because of his youth, rebounding prowess, and an addition year on a reasonable contract. 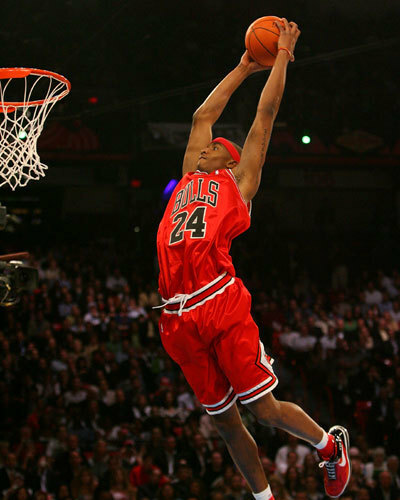 Throw-in 22-year old PF Cedric Simmons by sending Adrian Griffin to Seattle and the Bulls frontcourt continues to get younger and more athletic. Still, at first glance the addition of Hughes was a huge head-scratcher. With Hinrich already providing a similar role as an overpriced underperforming combo guard, Ben Gordon looking for more than 11 million this summer, and Thabo Sefolosha looking impressive as a starting 2-guard over the last month, I couldn’t figure out where he fit and assumed Johnny Pax had somehow lost his marbles overnight. Initially, with Hinrich making around 10-million a year for the foreseeable future (until 2011-12) and Hughes owed around 13-million for this year and two more, the local scribes and 12-oz curl GMs at the watering-hole assumed Gordon would be the odd man out next year. 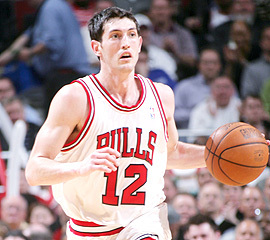 Whether Pax would work out a sign-n-trade or just let him walk, it seemed inconceivable the Bulls could have three guards making 8-figures apiece (to be fair, Hinrich’s deal decreases each year and he’ll be making 8-million by 2011-12). But after further review and a little faith that my favorite GM still knows what he’s doing, I started to see a different angle from this trade. With the addition of Drew Gooden, maybe the still valuable chip known as The Tyrus Thomas Project could entice a GM to take on Kirk Hinrich’s deal and then Reinsdorf would sign-off a long-term deal for Ben Gordon. Think about it, the Bulls have tried for years to make the Hinrich/Gordon combo work, but Gordon’s inability to defend the 2-spot or handle the playmaking duties has left them in a quandary. Under this theory, a Hughes/Gordon combo makes much more sense as Hughes can handle the point as he did in Cleveland and has the size to guard the scorers on the wing. The problem with a Hinrich/Hughes combo is that it’s impossible to win in the Association without spot-up shooters. While both can knockdown the occasional jumper, neither strikes fear enough to cause opponents to alter their defense. Not to mention, with the Hughes/Gordon combo, the Bulls can still develop Thabo with plenty of minutes as he can fit alongside either. As for the frontcourt in my brilliant theory, while the two-headed monster of Deng and Noce is one of the best small forward duos in the league, Noah and Gooden need Paxson to hit a homerun for what he can pull-off for T-Time and Capt. Kirk…and I think I’ve found it. 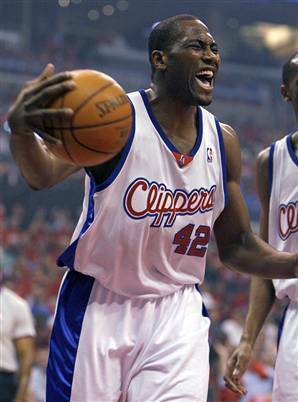 Welcome Home Elton Brand! A sign and trade between the Bulls and Clippers makes sense both financially and strategically for both teams. For the Clippers, Chris Kaman has been unbelievable in the middle this season and is starting to prove he can handle the bulk of low-post opportunities. Unfortunately, the combo of Kaman and the “soon-to-be-free-agent” Brand is their lack of athleticism. With Tyrus Thomas, the lottery bound Clippers get another rising-star with the athleticism to play alongside Mr. Kaman. As for Hinrich, with Cassell trying to win a championship in Boston (or elsewhere) and the unexpected recovery of Shaun Livingston after a devastating knee-injury, the Clippers would get some stability at the guard-spot, with a contract that gets smaller by the year. The Bulls new line-up would look Flawless! And now, onto the new look Bulls. A starting line-up of Hughes, Gordon, Deng, Brand, & Noah, with a solid bench of Noce, Gooden, & Sefolosha…I think we’re getting some-where. While Noah is still young, he does all the dirty work in the paint and has the size to look perfect alongside Elton. Throw-in a backcourt that will no longer be criticized for having more value at Great America as the determining factor in how tall you have to be to ride a roller-coaster, and this Bulls fan is starting to smile. Call me crazy, but in the abysmal Eastern Conference, besides the Celts, Cavs, & Pistons, I’d put the 2008-09 Bulls as candidate for homecourt in the 1st round and designed to make some noise for years to come. Of course, I could be completely wrong about all of this, but after becoming a stockholder in Ibuprofen from my trips to the United Center this season…one can only hope. The Warriors must forget about the beach and worry about a cover! The Knicks no longer even look Isiah in the face! If all goes well, hopefully we won't have to break out the Snow-Boots this weekend Homeboys! This page contains a single article from March 7, 2008 1:01 PM.